Mobile VR is great, but there's plenty of room for improvement, particularly when it comes to screen resolution - and Sharp has just given us a look at virtual reality's future with a new prototype display. 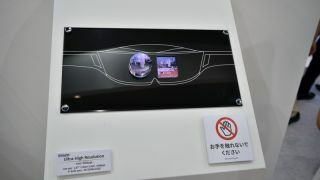 The small 2.87-inch screen, which was spotted by PC Watch at Japan's CEATEC expo, packs an enormous number of pixels into a tiny space, allowing each eye to view a 1920 x 2160 display, for a pixel density of 1008ppi. Viewed through both eyes it outputs at 3840 x 2160, allowing you to watch 4K content. Few mobile screens even approach that resolution yet, and where they do they're larger - so the pixels have to fill more space and images aren't as sharp. The QHD Samsung Galaxy S7, for example, comes in at 577 pixels per inch, and even an unreleased display shown off by Samsung is only 806 pixels per inch. Mobile VR, like that offered by the Samsung Gear VR and Google's new Daydream platform, is the most accessible and affordable VR entry point, but it's also more limited than high-end options like Oculus Rift and HTC Vive, with screen resolutions being one of the main limiting factors. A resolution this high is overkill for normal smartphone use, but important for VR, where the screen is positioned close to your eyes. Of course it's not just resolution that matters, but also overall quality, contrast and color accuracy, so Sharp's display ticks one of those boxes, but it remains to be seen whether it will tick the rest. Even it doesn't, there's time for Sharp - or another company - to make one which does, since it's unlikely we'll see displays this sharp on smartphones or in VR headsets for a while yet, but this could give us a glimpse of where smartphone screens and mobile VR could be a few years from now. And this wasn't the only forward-looking screen the company showed off, as a prototype smartphone with a true edge-to-edge display was also revealed, sporting a front panel that's all screen and actually looks good, unlike some smartphone concepts. Again, we don't expect to see phones like this for a while, but with Apple supposedly working on something similar it might not be a too distant future.